Wolves duo Jordan Graham and Kortney Hause have signed new long-term contracts at Molineux. Winger Graham and versatile defender Hause, both 20, have signed new deals with the Championship club until 2018 and 2019 respectively. Both players are currently recovering from long-term injuries. 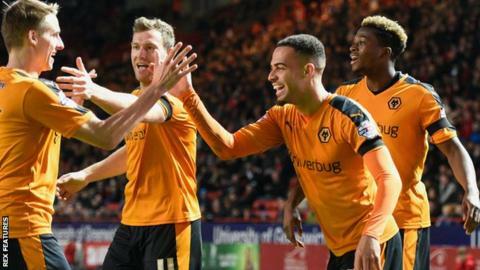 "They are outstanding young players who have made good inroads into the first team over the last year or so," said Wolves head coach Kenny Jackett. Wolves also have the option to trigger a two-year extension on Graham's contract which, if activated, could run until 2020. Ex-Aston Villa youngster Graham suffered a cruciate knee ligament injury against Cardiff in January and is expected to be out for more than nine months. Hause has made 15 appearances for Wolves this term but has not played since October because of a hamstring problem.